Homo habilis is the earliest known species in the human lineage. Named in 1964 by Richard Leakey, the term ‘habilis’ refers to ’being handy.’ This name was suggested because the hand and foot remains of this species were of special interest to the anthropologists studying locomotion. Our hands and feet enable us to perform a variety of functions, such as digging soil, grasping objects, and even hanging from the stems of trees. More specifically, feet enable walking, crawling, running, and jumping. Unexpectedly, a fossil belonging to this species, dating from approximately 1.75 MYA, was found in Tanzania. This Olduvai foot (Durant 1989:23) was reconstructed in 1960 and allowed scientists to conclude a few points about this species. The fossil was complete except that the back of the heel and terminal bones of the toes were missing. Interestingly, this fossil displays a modern human characteristic: the stout basal bone of the big toe is aligned with the other toes (Isaac & Leakey 1969). In apes and monkeys, the big toe is quite robust and diverges from the other toes (Isaac & Leakey 1960). The aligned toes indicate true bipedalism. The fossil also shows that H. habilis had the ability to force debris through it in a nonprehensile way (Durant 1989:24). In addition, certain features of the wrist and the hand are suggestive that H. habilis had the ability to grasp objects and make stone-tools. This evidence allows researchers to conclude that H. habilis, a species that existed in Eastern Africa over a million years ago, exhibited a mode of locomotion very similar to that of modern humans. Little is known about the teeth of Homo habilis. Relethford (1994) states that the teeth of Homo habilis are thought to be larger than those of modern humans. In addition, the shape of the premolars of this species were more elongated than were those of their ancestors and, thus, much more similar in appearance to those of modern humans. Most Homo habilis fossils derive from Olduvai Gorge, Africa (Isaac & Leakey 1960). Several fragmentary specimens indicate that this species possessed an enlarged brain (Durant 1989). Among the fossils found in this area, the smallest brain had a cranial capacity of 550 cc. The brains of two other fossils were measured to be 650 cc and 687 cc. An additional cranium fossil was found at Koobi Fora, KNM-ER 1470 and KNM-ER 1813. Unfortunately, little is known about this fossil. Moreover, anthropologists date that H. habilis originated between 2 and 1.9 million MYA, followed by Homo erectus, which dates to approximately 1.7 MYA. As a result, H. habilis was the first species that possessed the characteristic enlarged brain. This enlarged brain is also closely associated with the ability of using stones for tool-making. A significant question about human evolution revolves around the kind of environment members in this lineage resided in. The site of the fossils found at Olduvai Gorge indicates that this species inhabited open grasslands near the edge of a lake. Other animals that also resided in this area include elephants, giraffes, wild pigs, various species of antelope, rabbits, baboons, hyenas, lizards, tortoises, and birds. Among these animals, early members in the human lineage preyed on lizards, tortoises, pigs, rabbits, young antelope and fish from the nearby lake. In addition, they probably depended on carion left by larger predators, like lions. The sites where the fossils were found provide confirmatory evidence that Homo habilis inhabited shelters, dated to be as long as 2 MYA. One site contained different types of stone tools and rocks assembled in a semicircle, as if they formed some sort of a windbreaker. Another site contained special stones, quartz, and lava, which researchers assume to have been carried from another location that was approximately five km away. These stones could have been used in defense, to be thrown at other animals or even as raw-material for carving weapons. Yet another site covered an area of approximately 316 square metres, over which different tools and bones were scattered. Lastly, researchers assume that fire had yet to be harnessed, because there was no sign of a hearth in the ground. This hints that members in this species were not yet cave-dwellers, as they would have required fire to scare away other animals that resided in caves. As the lifestyle of Homo habilis largely involved hunting, possessing intelligence and, thus, a larger brain would have been beneficial. A larger brain would have allowed for better tool-making skills, language, and co-operation with other members of the species. As a result, females would have required larger pelvis to account for the large brain size of their offspring. This would have hindered adult female mobility and created a division-of-labor between the genders. While males would travel large distances seeking food to nourish their family, females would stay at the home-base and rear young. Perhaps the females engaged in gathering small fruits and herbs that were proximal to the home-base. Consequently, the first human family unit formed, together with the couple-bond and a strong association between mothers and their infants. Social integration between other members also would have been enhanced, as the males would collaborate together in searching and hunting for prey. Sites for Homo habilis revealed at least 11 different kinds of tools, which range in size from a tennis-ball to a walnut and are known collectively as the ‘Olduvan industry.’ These tools were used for hunting, self-defense, and food preparation. They include certain types of choppers, notched tools, flakes, chisels, scrapers, and gouging and engraving tools. In addition, these tools were adequate for activities such as skinning animals, such as antelope. The Olduvan tools also would have been useful for making wooden or bone clubs and even to protect prey; other uses include digging through soil to search for tubers, bulbs, edible roots, and insect larvae. Even though these hominids consumed a diet of vegetables and meat, food still was relatively scarce, allowing individuals to maintain low population densities over large territories. Here, bipedalism would have offered a big advantage, because it definitely would have facilitated transporting materials, tool-making, tool gathering, and hunting. Scientists postulate that this species possessed a language to enable communication, considering they had large brains, which enabled them to design tools. Since the brains of these hominids allowed them to construct tools, they should have been capable of forming basic language. Also, some form of communication would have been essential in raising the young, sharing and preparing food, and signaling for danger. Hunting for prey also would have been more successful if it was somehow planned in advance. Moreover, it would have been beneficial if certain taboos were communicated to other members of the unit, to ensure safety and protection. Lastly, language would facilitate co-operation, by providing signs of appreciation and thankfulness to be communicated to other members. This lifestyle could represent the early, primordial way of human culture. The name Homo ergaster means ‘working man.’ This name was chosen to document the discovery of a variety of tools, such as hand-axes and cleavers, near the fossil remains. Currently, controversy surrounds whether H. ergaster or the later, Asian, H. erectus is more closely related to modern humans. Homo ergaster is one of the more-problematic species in the human lineage because there is no clear distinction between H. ergaster and H. erectus; generally most H. ergaster and early H. erectus fossils geographically are confined to Africa. Sometimes, H. ergaster has been categorized as a subspecies of H. erectus, but most researchers consider that too few differences exist to separate them as species. In fact, some researchers deny any validity to the species H. ergaster at all. There also are a number of fossils that are considered as representing H. ergaster and H. erectus. The most-notable specimen of this type is the nearly complete skeleton of a young boy found near Lake Turkana, known as "Nariokotome boy". These remains will be discussed under the section describing H. erectus, as the specimen is most commonly classified as such. The use of more-complex tools than were used by the earlier H. habilis shows that H. ergaster also was bipedal, a characteristic of all later Homo species. Relying on their feet for support and locomotion freed their hands to use Acheulean axes and other tools. C. Groves and V. Mazak first described the taxon ergaster in 1975, after recovering an isolated mandible (specimen ER 992). The dentition of H. ergaster is comparable to that of H. erectus, which is discussed below. H. ergaster shows an increase in cranial capacity (700-900 cc) from that of H. habilis. The skull bones are thinner and lack an obvious depression, or sulcus, on the surface, which may be the most-distinguishing characteristic between H. ergaster and H. erectus skulls. Also, the face of H. ergaster is less robust (more gracile) than is that of H. erectus. H. ergaster skulls also display increased cranial breadth across the parietal bones, as well as an increase in the length of the occipital bone. A broadening in the nasal bones and nasal openings also can be seen. H. ergaster skulls also show a shorter cranial base and greater development of the mandibular symphysis. H. ergaster used tools of the Acheulean industry, which are more-advanced than the Oldewan tools used by H. habilis. Several different kinds of tools are associated with the Acheulean industry, the most important being the hand-axe. Hand-axes often were bifacial, having two distinct sides, and made by hammering flakes off stones to make the axe, with the remnant flakes being used as cutting tools. Hammer stones and cleavers also were used by H. ergaster,and had characteristic perpendicular edges. H. ergaster first began using these tools 1.6 MYA. Remains of H. ergaster have a mandibular symphysis, which shows strong markings for the digastric muscle (important for swallowing and vocalization). Some people have interpreted this characteristic as proof that language had developed by this time. Further analysis conducted on H. erectus, discussed subsequently, reveals that the presence of vocalization rather than effective speech was likely the case. H. erectus is thought to be the first migratory Homo species, albeit contentiously. Several theories concerning the dispersal of early humans have been developed. The 'Multiregional' or 'Regional Continuity' hypothesis involves parallel evolution, foumulated on the basis of fossil evidence. The other models, which were formulated on the basis of fossils, archaeology, and genetics, involve an African origin for human evolution, the most well-known among them being the 'Out of Africa' hypothesis. This hypothesis comprises continuous evolution, with individuals originating in Africa and migrating to Europe and Asia. Some variations among the many African origin hypotheses involve gene transfer between lineages, which will not be discussed here. The genetic evidence used as the basis for many of these hypotheses involves mitochondrial DNA, which is inherited through maternal lineages only. Wilson and Cann (1992) used DNA evidence to trace human origins to an African woman that lived 200000 years ago. The dentition of Homo erectus is similar to that of H. sapiens. The earlier species, H. erectus, exhibited somewhat larger teeth than did H. sapiens; however, H. erectus shows some dental reduction when compared to earlier Homo species. The interesting feature of H. erectus teeth is located on the backside of the incisors. These teeth are ‘scooped’ in appearance and referred to as ‘shovel-shaped.’ Researchers have suggested that such teeth constitute an adaptation for hunter-gatherers to process food. Compared to the early Homo species, Homo erectus shows considerable brain enlargement, with a cranial capacity between 600 and 1250 cc. The lower range comes from evidence from the Dmanisi site, which could be late H. erectus or early Homo sapiens. Although H. erectus exhibits significant increase in cranial capacity, this species also exhibits increased body size. When H. erectus is compared with larger, early Homo fossils, relative brain size was about the same. The cranium of H. erectus has a highly distinctive shape, partly as a result of increased brain size but more related to increased body size. Most notably, in Asian specimens, H. erectus had a thick cranial bone, large brow ridges (suborbital tori) in the front of the skull, and a projecting nuchal torus at the rear of the skull. The nuchal torus, the attachment site for neck muscles, is used to hold the head up. The Homo erectus cranium also has a distinct shape with a long, low vault receding back from the brow ridges with little forehead development. The cranium of Homo erectus is wider at the base when compared with early Homo species and modern Homo sapiens. The maximum breadth is below the ear openings, giving it a pentagonal shape when viewed from behind. Early Homo and H. sapiens have more-vertical sides to their crania, with the maximum breadth occurring above the ear openings. The oldest remains of H. erectus are dated to approximately 1.8-1.6 MYA; however, the older findings are indistinct and still could be considered early Homo sapiens or H. ergaster. The most-recent remains have been dated to 10000 years. If this were accurate, then Homo erectus was more than likely the first continental migrants, migrating out of Africa, where early Homo remains are located. Many of the older findings were located in Africa, where H. erectus is hypothesized to have appeared first. In 1994, a hominid tibia was recovered in Southern England from the Boxgrove site, dated to be 500000 years old. The best evidence of H. erectus in Europe comes from the Ceprano site in central Italy, where findings including a cranium suggest a date of 700000 years ago or greater. In 1984, an almost-complete skeleton was uncovered in Nariokotome on the west side of Lake Turkana in Kenya. Due to effective tools, larger body size, and metabolic demands of the brain associated with H. erectus, most researchers postulate that, by the time H. erectus had evolved, meat constituted an important part of the human diet. Hunting habits in H. erectus still are unclear; researchers think that individuals in the species still were scavenging but, also, caught small animals and fish. Some sites, such as in Torralba and Ambrona in Spain, show evidence of large-game hunting by controlling stampedes. These sites reveal evidence that a stampede of large, elephant-like animals was forced off a cliff. Hunting like this produced large amounts of meat that could be shared by many members of the group. An abundance of Acheulean tools littering in the sites shows that butchering of animals was performed on site and smaller, more manageable pieces of meat and bones or other animal materials were carried away. The Zhoukoudian site in Beijing is one of the sites of the longest habitation by humans, according to the Chinese. Many cultural remains have been found at this site, including many Acheulean tools divided into cultural stages. Tools in the earliest stage (460000-420000 years ago) are large, weighing approximately a half kilo, and made of soft stone, like sandstone. Tools in middle stage (370000-350000 years ago) are smaller than are those in the earliest stage and weigh under a half kilo. In the final stage (300000-230000 years ago), tools remained small, and the quality of the tool materials has improved. Quartz, which is coarse, used in earlier periods, was replaced by finer quartz in the final stage. The tools made of sandstone almost disappeared, while the frequency of flint tools increased by approximately 30%. The earlier tools lacked shape and were crude. Tools became more refined over time. There is, however, a problem with the fossil record of Acheulean tools: Tools were absent from China and Southeast Asia. This could be because these areas harbor no stones suitable for making tools. The lack of tool remains could be explained if H. erectus in these areas used materials for tools that could not be preserved as fossils, such as bamboo. H. erectus probably lacked the ability to communicate using speech. Three reasons for this conclusion have been suggested. First, analyses of the different areas of the brain show that H. erectus was incapable of speech. Examinations of Broca’s area, the area responsible for hierarchical organization of grammar and manual manipulation of objects, shows that it was well-developed. This is consistent with H. erectus’s use of complex tools and could show the capacity for language; however, analyses of Wernicke’s area, the part of the part of the cerebral cortex responsible for production and comprehension of meaningful speech, showed uncertain development. Although these findings are inconclusive, H. erectus probably lacked the capacity for meaningful communication through speech. Secondly, H. erectus, as observed from “Nariokotome boy”, the thoracic vertebrae are much smaller than are those of modern humans, suggesting a much smaller spinal nerve canal. The fine-tuned control of breathing that is necessary for successful vocalization is made possible by the extra nerves in the thoracic spine in modern humans. Fossils classified as Homo heidelbergensis have been dated from 400000 to 100000 years ago and discovered at locations in Europe, Africa, and Asia. The fossils have an average height of 1.8m , and individuals possessed a broad nose and face, a large cranial volume, as well as some plesiomorphic dental features. Although a fossil with intact feet bones has yet to be discovered, three tracks of footprints thought to be from Homo heidelbergensis were found on the slopes of Mount Roccamonfina, Italy in 2003. These footprints were made in ash, which later fossilized, and have been dated from 385000 to 325000 years ago using radiometric techniques. The footprints are approximately 20 cm long and 10 cm wide. Using the average foot-length-to-height ratio of 15 per cent, this suggests the individuals who made the tracks were only approximately 135 cm tall, much smaller than the fossilized remains of Homo heidelbergensis previously discovered, leading to the assumption that the footprints were made by children or adolescents. From the footprints, researchers suggest that Homo heidelbergensis had identical bone structures (in the feet) and gait to those of modern humans (Mietto et al. 2003). Homo heidelbergensis possessed a cranial volume, which ranged from 1100 to 1400 cc, approximately 93% the size of the average Homo sapiens cranial capacity (Conroy et al. 2000). A skull known as Arago XXI is the most-complete Homo heidelbergensis cranial fossil discovered, lacking only occipital bones; this specimen has revealed that the Broca's cap and other speech areas were well-developed, evidence of an extensive right parietal association area, presence of marked parietal boss, presence of an angular torus, lacking frontal boss, a deep supraorbital sulcus, and a shift from the widest part of the brain case from the cranial base to the parietal regions (de Lumley & de Lumley 1974). A complete Homo heidelbergensis jaw, known as the Mauer Jaw, was discovered in 1907 and included such traits as a sloping symphysis that contains two mandibular tori on its inner side (a plesiomorphic dental feature), an especially broad ramus and robust mandible (plesiomorphic), an M2 molar that is larger than the M1 molar (plesiomorphic), taurodont molars (an apomorphic dental feature in the Homo genus), a reduced M3 molar (apomorphic), and dramatic buccal cusp dominance in the P3 premolar (apomorphic). General dental traits characterizing Homo heidelbergensis are a large jaw, heavy bones, and smaller teeth in comparison to Homo sapiens. (Schoetensack 1908). A great deal of evidence supports the hypothesis that Homo heidelbergensis hunted large game animals. This is supported by cut marks found on wild deer, elephants, rhinos, and horses from the same era. Some of these animals weighed as much as 700 kilos or more. Tools used include types of bi-facial stone in the Acheulean style. Homo heidelbergensis fossils have been discovered at sites ranging from Southern and Eastern Africa and much of Southern and Western Europe, and even a few sites throughout Asia. Some of the more-significant sites include Mauer, near Heidelberg, Germany, and Arago, France. Fossils classified as Homo neanderthalensis have been dated from 230000–29000 years ago, a time period known as the Middle Paleolithic. Neanderthals, as they are colloquially referred to, are characterized by robust bodies, projecting noses, receding chins, prominent browridges (supraorbital tori), large, round finger tips, a barrel-shaped rib cage, and large kneecaps. Males are, on average, 1.65m tall, and females are 1.55m (or 5’1’’) tall. Neanderthals also possess long collar bones, short, bowed shoulder blades, thick, bowed shafts of the thigh bones, short shinbones and calf bones, long, gracile pelvic pubi, and stout larynx. Homo neanderthalensis did not possess any defining features that would distinguish its bipedal locomotion from that of Homo sapiens. Neanderthal crania are characterized by a suprainiac fossa (a groove above the inion), an occipital bun, a projecting mid-face, a globe-shaped rear of skull , a low, flat elongated skull, and 1200-1750 cc volume (10% greater than modern humans). Homo neanderthalensis possessed extremely similar dental patterns to Homo sapiens, with the few exceptions being that they have no groove on canine teeth and a space behind their last molars. Homo neanderthalensis possessed stone tools (of the Mousterian culture), which included weapons, although it is unknown whether this included projectiles as well. Evidence of ceremonial burials has been discovered, which opens up the possibility that there could have been a complex belief-structure in place for Neanderthals as well. Graves containing bison and auroch bones have been uncovered, the pigment ochre, flowers, and tools were buried alongside the bodies. Neanderthals also constructed structures, controlled fire, skinned animals, and appeared to live in tribal settings. Neanderthal fossils have been uncovered in locations around most of Europe and the Middle East. Most anthropologists agree that Homo neanderthalensis are closely related to Homo heidelbergensis, without having migrated out of Africa like many of the other members of the Homo genus. Homo sapiens, like most of their relatives, are bipedal, which means they have an upright posture and walk with only their legs. Although bipedalism incurs disadvantages, these are far outweighed by advantages. The most important advantage is that upright posture is energy efficient and allows the hands to be used for other important tasks, such as carrying or building things with tools. The disadvantages of bipedalism include slow speed and strain placed on a body that was not intentionally designed to walk upright. Many of the problems arise from the fact that the weight of the body puts an incredible strain on anything below it, which means that organs and bones that normally had very little strain put on them now had to carry the weight of everything above it. The heart, for example, which normally rested on the posterior mediastinum, a structure in the chest, came to push against the diaphragm. To deal with this problem, the pericardium attached itself to the diaphragm, which allowed the heart to move with the diaphragm, as opposed to being pushed by it. The body has adapted to deal with many other mechanical issues, but it is not perfect, and, with aging, the effects of weight strain take their toll. The upright posture, which is maintained by muscle contractions and ligaments, uses a surprisingly small amount of energy, which allows the body to remain standing for many hours, whereas non-bipedal animals can rest on all four legs for only short periods of time. Walking upright is not the only form of transportation used by Homo sapiens. Developments in science and technology, which could have been achieved only by well-developed brains and freed hands, have allowed them to create mechanical forms of transportation. This includes bicycles, boats, automobiles and airplanes, enabling Homo sapiens to travel faster and farther than any known species in the world. The cranial capacity of the average Homo sapiens is approximately 1400 cc, which is a significant improvement compared to their predecessors. Modern human brains are composed of many structures, each of which performs a specific set of tasks. However, all of these structures can be categorized into three parts, or evolutionary steps, of the brain. The first part is known as the reptilian brain, which is the portion that we share with all the other vertebrates. This part of the brain controls instincts and all of the tasks required to keep us alive, such as breathing and temperature regulation. The second part of the brain is known as the mammalian brain, which, as the name suggests, is the portion of the brain that we share with all other mammals. This part of the brain introduced three major structures, which are the hypothalamus, the hippocampus, and the amygdala. The hypothalamus regulates fluid balance, internal body temperature, food intake, and sexual drive; the hippocampus is involved in forming new memories and creating mental maps of surrounding environment; and the amygdala is responsible for the feeling and expression of fear and anger. The third part of the brain is known as the human brain, which is the most-recent addition and defines what it is to be human. This part of the brain introduced what is known as the cortex, which is a coat of gray matter that covers the outer portions of the brain. The cortex accounts for approximately 85% of brain mass and contains wrinkle-like folds all around to increase its surface area. The cortex is split into four lobes, which are further divided into two hemispheres. The four lobes are known as the frontal, the parietal, the occipital, and the temporal lobe. The frontal lobe is responsible for strategic planning and organization; the parietal lobe is responsible for coordinating sensory information; the occipital lobe is responsible for vision; and the temporal lobe is responsible for the analysis of sound. All of these lobes are divided evenly into two hemispheres, known as the left and right hemisphere. The left hemisphere controls the right side of the body and is better suited to the production and understanding of written and spoken language. The right hemisphere, which controls the left side of the body, is better able to interpret music and spatial information. The teeth of Homo sapiens are composed of dentin, which is covered by enamel in the exposed areas. Enamel is a protective layer composed of calcium phosphate and calcium carbonate, making it the hardest material in the body. The tooth has three main regions, which are the crown, root, and neck. The crown is the visible upper layer of the tooth; the roots anchor the tooth into its respective socket located inside the gums; and the neck simply connects the crown with the roots. Unlike many animals, H. sapiens have differentiated teeth, each serving a different function. Incisors, which are located at the front, are used for cutting food. Canines, which are located beside the incisors, are used for tearing and shredding food. Beside the canines are the premolars and molars which are used for grinding and crushing food. During their lifetime, H. sapiens will develop two sets of teeth. The first set, also known as baby teeth, develops when the infant is 6 months old. This set contains 20 teeth, which comprise 8 incisors, 4 canines, and 8 molars. The baby teeth are replaced gradually by adult teeth, between the ages of 6 and 12. The adult set contains 32 teeth, which comprise 8 incisors, 4 canines, 8 premolars, and 12 molars. 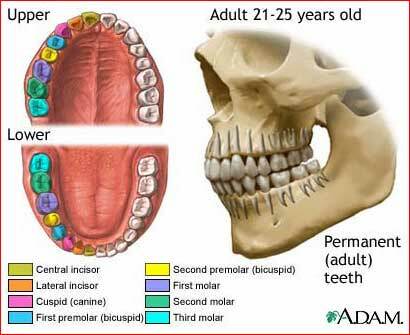 The last teeth to develop in the adult set are the wisdom teeth, which usually appear after 17 years of age. However, evidence that supports atrophy of the wisdom teeth is mounting. Due to changes in diet and advances in dental technology, the jaw has been reduced gradually in size to the point where it is difficult for it to find space for the wisdom teeth. In some individuals, wisdom teeth develop with reduced size, and, in others, they must be removed through surgery. Culture, according to anthropologists, may be defined as “the full range of learned human behaviour patterns.” These behaviour patterns include things such as art, literature, music, customs and religion. Culture is difficult to study because it is not a tangible object but, rather, an abstract idea accepted by the members of a society. It is possible to study culture by looking at the products produced by it, but they are not always relevant or helpful to the study. All human culture is based on common themes and ideas that are universal to all human beings. Carl Jung described this as the collective unconscious. One of the most-interesting aspects of culture is religion, which is a system of beliefs that individuals use to give their lives meaning. Common themes in religion include the existence of an afterlife and supernatural beings, reincarnation, and accountability for worldly actions. Ceremonial burials often go hand-in-hand with religion. They often are used to give closure to family and friends and to ensure that deceased individuals experience smooth transitions into the afterlife of their respective religion. In our opinion, culture simply is a byproduct of having larger and more powerful brains that are capable of dealing with abstract concepts. Currently, Homo sapiens are found in every part of the world, from the freezing temperatures of Antarctica, to the blazing deserts of the Middle East. Despite the fact that they have a very narrow temperature range, they are able to live in such varying climates because of their ability to use technology. We know that Homo sapiens are found all over the world; but how they got there is the subject of much research. Two major hypotheses address this issue: the Out of Africa Hypothesis and the Multiregional Hypothesis. The Multiregional Hypothesis stipulates that Homo sapiens evolved independently all over the world from their respective native populations, and that there was some gene flow between these independent populations that prevented speciation from occurring. The Out of Africa Hypothesis states that Homo sapiens evolved in Africa, then left the continent 50000 to 100000 years ago and replaced native populations in other parts of the world. Evidence supports both theories, but, currently, consensus is emerging for the Out of Africa Hypothesis. Genetic evidence shows that variation among individual humans is very small. If Homo sapiens evolved independently, we would expect to see more genetic variation. Archeological evidence also supports the Out of Africa Hypothesis because artifacts typical of Homo sapiens were found in Africa much earlier than in other parts of the world. At archeological sites in Europe, a sudden change in artifacts was observed at around the time Homo sapiens were believed to have left Africa. This sudden appearance of new artifacts indicates that they did not evolve gradually from the native populations but, rather, that they came from Africa and introduced themselves into the population. Cartmill, M., W. L. Hylander & J. Shafland. 1987. Chapter 17: Upright Posture and Locomotion, page 322-338. Human Structure. Harvard University Press, Cambridge, Massachusetts. Conroy, G.C., G.W. Weber, H. Seidler, W. Recheis, D. zur Nedden, J. Haile Mariam. 2000. Endocranial capacity of the Bodo cranium determined from Three-Dimensional computed tomography. Amer. J. Phys. Anthropol. 113:111-118. Day, R. 2003. Chapter 1: The Basics of Brain and Behaviour, page 46-56. Psychology: The Basics and Beyond. McMaster University Custom Courseware Production Services, Hamilton, Ontario. de Lumley, H. & M.A. de Lumley. 1974. Pre-Neanderthal human remains from Arago cave in southwestern France. In Yearbook of Physical Anthropology 17:162-168. Durant, J. R. Human Origins. Oxford: Clarendon Press, 1989. Howell, F. C. Early Man. New York: Time Life Books, 1976. Howells, W. Evolution of the Genus Homo. London: Addison-Wesley Publishing Company, 1973. Isaac, G. and R. E. F. Leaky. 1960. Human Ancestors. San Francisco: W.H. Freeman and Company. Jurmain, R.,Kilgore, L., Trevathan, W., & Nelson, H. Essentials of Physical Anthropology: Fifth Edition. Belmont, CA: Thomson Learning Inc, 2004. Mietto, P., Avanzini, M. & Rolandi, G. 2003. Human footprints in Pleistocene volcanic ash. Nature 422:133. Molles Jr., Manual. 2005. Chapter 4: Temperature Relations, page 106, figure 4.23. Ecology: Concepts and Applications 3rd ed. McGraw Hill, New York. Relethford, J. The Human Species: 2nd edition. Toronto: Mayfield Publishing Company, 1994. Schoetensack, O. 1908. Der Unterkiefer des Homo heidelbergensis aus den Sanden von Mauer bei Heidelberg. Leipzig: Wilhelm Engelmann. Tortora, G. 2005. Chapter 25: The Digestive System, page 773-775. Principles of Human Anatomy 10th ed. John Wiley & Sons Inc, Hoboken, New Jersey. Tullar, R. M. The Human Species: Its Nature, Evolution and Ecology. New York: McGraw Hill Inc., 1977.